Looking for something similar but sliiiightly less than $2150? 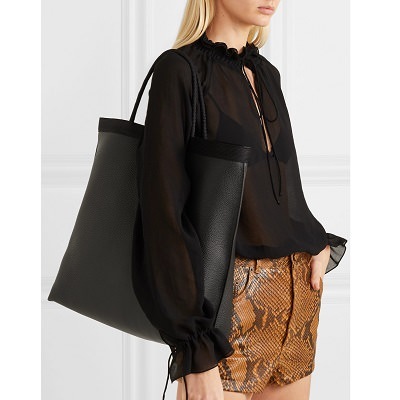 This best-selling tote is $78-$188. « The Kid Question: Have You Ever Felt Like You Needed to Choose Between Kids and Career? What would you say the difference is between a dowdy/frumpy floral print and beautiful/sophisticated floral print? Would your analysis change if the wearer of said print is fat? no, it’s all about the print (modern or not) and the cut of the garment, not the size of the wearer. Annie wears some great prints on Shrill (including a really cute red ditsy floral dress). I prefer a non-white background for floral prints, especially small florals — a saturated color looks great. Great question! I love florals. I think the ones that don’t work are the ones that look cheap, somehow sloppily drawn like the pattern on paper plates or something. Not enough dimension in the colors or lines. Vintage-looking floral prints are beautiful, though, and lots of trendy companies use them. As for size, I don’t think the size of the wearer matters, but the fit of the garment does. If you’re wearing a rather loud or large floral print, I think the garment needs to fit especially well or else it looks like you’re playing dress-up in grandma’s closet. I’m fat (size 18) and am just now coming around to prints after many years of disdaining them or being VERY choosey. One thing I’ve heard recently, perhaps it was Lindy West? was – if you’re an overweight woman, the world will always have something to say about how you’re dressed and how you look. So do what you want. High five internet friend! I would even go one step further, if you a woman (period) then the world is always going to have something to say about your choices. So all ladies should do what they want, eff ’em. I think small florals generally look better but I have a dress with large florals that I love so I guess it depends on the item. I agree that a non-white background is less dowdy. I believe the old line of thinking is that petite women should wear small prints and larger women can carry off large prints. I’m plus size and do either. I avoid most florals though. I know they’re hugely popular right now. But they always feel more Easter appropriate than office for some reason. On the rare times I do a floral at the office, it’s usually something with a dark background (charcoal, dark green, black, etc.) and with flowers that have a clear pattern to them (vs. more free flow placement of large and small flowers) if that makes any sense. The difference is in the cut and fabric. A cotton, slim cut, stiff floral blouse reads dowdy to me. The same print in a silk utility blouse could be lovely. Medium/larger flowers rather than tiny ones. I’m really confused with florals rn. I feel like the styles I wore in middle school are in again. The little tiny flowery prints in primary colors with ruffles and/or puffy sleeves. I’m not sure if only teens can wear them but I see them styled on adults. I would feel soooo frumpy wearing something like that at my age (35). Replace curtains with cushions and sofa and I’m right there with you. I’m interested in getting a new handbag but I’m realizing that I’m really out of touch with what’s in right now. I browsed Gucci’s website (a brand I loved just a few years ago) and I hated everything. Any suggestions on other brands I should look at? I’m typically a shoulder bag/hobo/tote type. Also I saw a bag that caught my eye on Italic – the site claims they work with the same factories that manufacture for designer brands. Has anyone purchased from them before? I really like Cuyana bags. I have the small hobo and love it. If you want a hobo bag, I love the Chloe Marcie bag. I have the Italic giant tote bag and it is well-made. I support a purchase from here. Also, Cuyana bags are beautiful. I got the Revlon styler brush thing in the mail today and I’m so excited to use it! Does anyone love theirs and have any tips? I have EXTREMELY thick, dense wavy hair, so I am thinking I will have to dry it most of the way with a regular dryer and then use the Revlon brush to smooth and straighten. I really hope this thing works! I never blow my hair straight usually because it takes too long and hurts my arm. I have thick hair curly which i flat iron but the Revlon styler gives me a ton more volume. You need your hair to be fairly wet or at least pretty damp for this to work. Part your hair and work in small sections, you might even get away with the lower heat setting. Finish with the cool setting. I do find that i have more flyaways with the Revlon but they calm down as my hair gets a bit more oily. I do think this is easier than a blowdryer + brush combo. Also, be prepared for the boar bristle things to fall out a bit. There are tons of YT videos too. I have extremely thick hair as well and just bought this based on all the recs from this site. I normally wash my hair at night and then sleep with it wet. When I wake up it’s still a bit damp and I use this to finish drying it. It would take way too long to use it when my hair was completely wet. If I was going to style my hair right after washing, I’d blow dry until it was only slightly damp, then use this to finish. I love it so much! I dont have thick hair but its pretty curly- the drybar brush crush straightens it really well, and it’s a lot less damaging than the flat iron. I’ve found it easiest to blow dry my hair about 80% dry and then finish with the Revlon brush. I still have to flat iron a coupe of pieces near my hairline because of my curly hair and postpartum hair loss. Good luck- I love mine, it gives me so much volume and helps my blowout last longer! Can you please report back in a few days what you think of it? I’m tempted to get it after all the positive comments here. I let my hair air-dry but would love to look more polished. Forgot to add, assume I cannot look for another job. I’d be grateful for all other suggestions. If you’re in a small, rural hospital, my assumption is that looking for another job is not an option. What kind of training do you need? I seem to recall that you’re relatively young. Are there professional seminars (online or in person) that you could take? These can be related to accounting, hospital management, the legal areas, or anything else that your work touches on. These seminars can be outstanding for learning how to do actual work in the field, in a way that you don’t learn in university. I think there are, and I should get on that. It’s a little hard to attend conferences and such (see: rural), but I definitely need to see what else is available to me. Thank you. Not sure how applicable it is but the Healthcare Financial Management Association (HFMA) offers a ton of free webinars (they’re all sponsored). http://www.hfma.org They count for continuing ed credit so there is some oversight that the sponsor doesn’t get too commercial. You also may find your state chapter useful for education. Some regions also are more active than others. If it’s training on coding or the like, AHIMA might have some offerings. I agree though in terms of the day to day. I’d try to reserve on on one meetings. Identify what training you need and where else you can get it. It’s great you guys sound like the team itself is strong though. That’s saying a lot after all you guys have been through! Two hours a day seems way too long. Can you schedule a weekly check-in meeting at a convenient time where you talk about what projects are ongoing and you can take discreet tasks from her and run with them? Can you identify what exactly you need training on and run down some resources to get it done (continuing ed, seminars, online training, etc)? Do you need to shadow or meet with other departments? Reporting structure aside, is there someone else who can provide some of whatever training you need. Well, factoring in the interruptions, it usually ended up being about 45 minutes of actually working together. But I like the weekly meeting suggestion – other managers in our hospital do this with their direct reports. Unfortunately there isn’t anybody else who has this training at our facility, but I can definitely look into online/external resources. Thank you. Apologies if you know this, but check out HFMA as an industry group for training. I do! That’s exactly what I was thinking of. Oh, also, speaking as someone who sells stuff to hospital finance people, I bet you could get a vendor to sponsor your flight etc to some training. ?? Please tell me more. Depending on your role (and probably your employers size) many of the companies that sell software will do things like fly happy clients out to conferences. I would also throw out that depending on your role, you might be able to go work for a vendor that sells into hospitals. I know you said you’re an accountant but the day to day function of that job title is very different across the many hospitals I’ve worked with. Do you have a regular meeting scheduled with her? For my direct reports whose work actually overlaps with mine a lot (I’m also in hospital admin), I have a weekly/bi-weekly one-on-ones with them and having that meeting in place has made it easier to delegate tasks because we’re still checking in regularly about them. Are you able to identify specific tasks you think would make the most sense to take off your plate? I think if you pitch something specific and frame it as wanting to take it on so you can learn how to do it/advance your knowledge rather than taking it off her plate because she’s overwhelmed, that would be pretty reasonable. Doesn’t mean she’ll necessarily take you up on it, but would at least set the stage for future discussions. Also, how chummy are you with her other direct reports? Could you ask them if there’s anything you could help them with? Might reduce how frequently they’re going to her, which might free her up to train you to take more off her plate. I don’t have a regular meeting – none of us do. I think that would be good though, so I will bring that up. I have been able to identify specific tasks, but I think using the angle of me learning how to do it vs. her being overwhelmed is a good one. Maybe when I say, “let me do that, you’re overwhelmed,” she’s thinking, “You can’t do that, you’re just going to make more work for me in the long run,” and pushing back for that reason. We’re all very chummy, actually, but I can’t help the other direct reports with their functions very much as they’re very different from mine, including sometimes using different software that I haven’t been trained in. They’re both fairly well-trained, but one is also newly trained and therefore insecure, and the other is one of those people who needs to update you every time she calls somebody even if all she did was leave the same message with them for the third time. However, your comment helped me see that when we do work together, boss is often the one who is asking us “did you guys do that? No? Sally, can you get those invoices for Vicky please?” and I definitely can pick up that slack and ask Sally for the invoices myself. Are there discrete tasks you’re trying to take on? Are there previous examples of those tasks? If so, stop spending time on training and start doing the work. Also in accounting and my strategy is to ask to “take the first cut” on a project. Usually there was a box of paper files, they’d direct me to the digital files and I’d vanish for a couple of days. I’d use previous examples, general accounting skills and then schedule a meeting to review my work. Hm. I was about to say “no this is different” and then realized it really sort of wasn’t. What she’s struggling under the weight of right now is providing all the evidence to our auditors (we got picked for some random Medicare audits too – joy). I found that very daunting, wanted to help but did not know how other than having her hand-hold me through it. I think if I get a sense of where she is on the project and then ask for last year’s files/submissions, I can do that. Thank you, that’s really helpful. Make a list of what all she does… Start learning how to do those starting from the easier ones in that list. Online learning, seminars, the associations, youtube , google, books … wherever you find help. And then, you offer help where you see fit. Sounds like you two could benefit from a “retreat” or just some time out of the office to identify routine tasks and then break them down into pieces – then you just start taking chunks on and ask for feedback. Just started using a daily retinol moisturizer on my (40-year-old) face. I’m acne prone on my jawline and neck. Should I be using the same lotion on my neck? I would guess not, but let’s not guess. Talk to your derm, particularly if the retinol was recommended or prescribed by them. As a probably not terribly useful point of reference, I have been using a derm rx’ed retinol for years. At my derm’s his directions, I do not use it on my neck. That doesn’t mean the same necessarily goes for you, but rather, different areas of skin on different people have different needs, so get a professional opinion as to what is best for you as an indivicual. I thought mine told me I could use it on my neck and décolletage once a week or something like that, but I never remember to do it. My goal this summer is to remember to put sunscreen in those places! Try once a week and then step up from there if it doesn’t get irritated. Going Out Blazer PSA — currently marked 21% off and an extra 15-25% off depending on whether you use JCrew card. Have your letter prepared and present it at the in-person meeting. Follow up via email with an electronic copy/thank you for the meeting. Your letter should request a shorter notice period and make a suggest re appropriate length of time you propose. I have only done this once and I tend to keep it brief — “just wanted to let you know that I’ve had a great experience here for x years, but I’m resigning with my last day being x. I’ll be headed to y next.” I know in some industries people don’t tell where they’re going so you can leave that part out if you want to. And I don’t see why you’d negotiate a notice period — tell them what you want and IDK but in my industry you keep it short 2-3 weeks; because after that time they transition all the work over to others (actually they do it in 2-3 days) and then you’ve cleaned out your office and are awkwardly just sitting around. As for email/letter — ask if they need one/what they’d like from you to get the out processing rolling. It’s industry specific and in lots of places they don’t need anything — they email HR and get it going. Make your letter just a very brief statement for HR, ideally with your official end date in writing. I would be sure to tell your manager what you said above about having loved working there (you appreciate that you’ve had the opportunity to x, y, z) but want to grow in a new direction. It’s not strictly necessary, but I think goes a long way to maintaining good will. DH and I agree that it would be nice to get me a new wedding ring for our 20th anniversary. We married young and I never wear my engagement/wedding ring set because it isn’t my style and I’ve lost one of the stones in the wedding band. I though about getting my solitaire reset but it’s fairly small and not really worth the effort. So, any suggestions for lovely wedding bands? I’m thinking that $10k is my target budget. I don’t think I want a big solitaire, maybe channel set diamonds? Or something else I’m not even thinking of? I never buy jewelry. Go to a few different stores and try things on! You may like something more than you thought you would. Ask your friends who are jewelry lovers if they can recommend a local jeweler. I had my wedding rings custom made by a local jeweler and I adore them. Try an independent jeweler. They often have estate as well as new styles. I have a favourite jeweler in Pasadena I highly recommend, Valia’s across from Vroman’s Bookstore. I would recommend looking at an estate jeweler for vintage or antique rings that are really unique and beautiful. My engagement ring and band are both from different estate jewelers (they do not match and I actually wear them on different hands) but I adore them and that they are different from anything else I’ve seen. I get compliments on them all the time. I love everything from Eragem. Check out their Insta. OMG yes. Just gorgeous, gorgeous stuff. I just wish I could find a guy to give me any ring at all; at this point anyone willing to marry me with money has a great shot, b/c I want a child b/f my egg’s go stale. FOOEY!